‘The Scarecrow’ bird scarer is a multi-purpose bird and animal deterrent that is designed to be used in a garden to deter larger species of birds and animals. The Scarecrow bird scarer is a water-based deterrent that operates on a 24/7 basis and uses a passive infra-red motion sensor to detect both heat and movement. 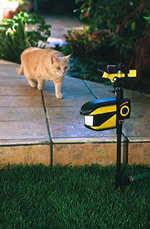 The Scarecrow bird scarer is triggered when the infra-red sensor beam is broken and the unit will shoot a stream of water, at garden hose pressure, for 3 seconds. The Scarecrow bird scarer then re-sets itself after 7 seconds. The Scarecrow bird scarer is designed to be used in a garden but could, in certain circumstances, be installed on a building as a pigeon control device. 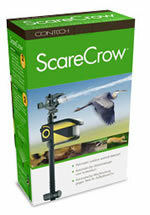 The Scarecrow bird scarer is sold with several decals that mimic the eyes and beaks of predatory birds. These decals are designed to be applied to the ‘head’ of the unit as an additional scaring technique but one supplier warns that these decals could scare small garden birds. If small birds are fed in the garden the decals should not be applied. The Scarecrow is powered by a 9-volt battery within the unit which powers both the infra-red sensor and the ‘high flow’ valve. The Scarecrow bird scarer will operate under normal circumstances for up to 6-months (or 3000 + activations) on one 9-volt battery. 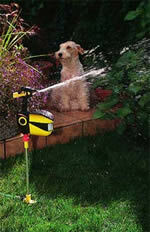 The Scarecrow’s water source is provided by a garden hose which is attached to a valve on the base of the unit. For larger areas several Scarecrows can be ‘daisy-chained’ using a single hose as the water source courtesy of the ‘flow through’ valve. The Scarecrow bird scarer will protect an area of up to 10 metres (90 square metres in total) from the unit in an arc ranging from 0°-300°. The Scarecrow bird scarer will use the equivalent of 2 - 3 cups of water during each activation making the unit extremely economical. The Scarecrow’s heat and motion sensor allow the unit to operate at night as well as during the day with the main benefit being the deterrence of nocturnal birds and animals. The Scarecrow bird scarer is intended to operate at water pressures of between 30 and 80 psi (2-5.5 Bar) but if water pressure exceeds 80 psi it will be necessary to fit a pressure-reducing valve to the tap. The Scarecrow bird scarer cannot be operated in sub-zero temperatures or heavy frosts due to the potential for water to freeze in both the hose and the Scarecrow bird scarer unit itself. The infra-red sensor window on the top of the unit must be kept clean and free of dust and dirt in order to maintain maximum sensitivity. If operating in an area of hard water the sensor window will need extra attention to ensure that calcium does not build up on the lens. The Scarecrow bird scarer should not be pointed at flowing water, in the direction of a road with moving traffic or, if in a particularly windy area, in the direction of the prevalent wind. The unit may be triggered by any of the above. As false triggering of the unit reduces battery life, the on-board optics automatically reduce sensitivity to reduce false triggering of the unit during daylight hours. When false triggering occurs the unit will re-set itself to a lower sensitivity setting within 5 minutes. The Scarecrow bird scarer is designed to be installed in a garden and therefore the base of the unit reduces to a spike so that the unit can be pushed into a lawn or flower bed. 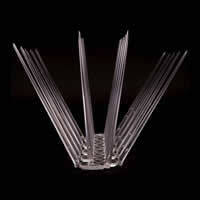 A footrest is provided near the base of the spike for the purpose of pushing the spike into the ground. An optional mounting bracket is also available that will allow the unit to be installed onto a vertical surface such as the wall of a house if no appropriate soft ground or lawn is available. This optional bracket could be used to install the device on any area of a building to deter pigeons from perching. The Scarecrow must be assembled prior to use and once assembled the unit must be set-up to enable the unit’s sensor to ‘see’ the target species within its 10-metre operating range. This operation is undertaken via the unit’s sensitivity knob. The sensitivity settings allow the unit to be calibrated to ensure that the unit will operate effectively once motion or heat is detected within the 10-metre range. Once The Scarecrow bird scarer has been positioned correctly and calibrated for sensitivity, the arc and distance of the water spray must then be adjusted. When operating correctly the sprinkler head will cycle back and forth from side to side effectively protecting the 10-metre area in front of the unit. One supplier of The Scarecrow bird scarer recommends that in order to mitigate water damage risks to the property, the amount of water available to the unit should be limited. This can be achieved by opening the hose valve to a maximum of ¾ of one turn, using a good quality hose pipe (or ideally using hard-plumbed irrigation pipes) and ensuring that the water pressure is within the normal operating range. The Scarecrow bird scarer has some disadvantages in respect of its ability to provide year-round protection, particularly when used in a climate with cold winters. In some areas the unit will be out of action for 4-6 months due to the potential for frost damage and yet it is in the winter when birds need to forage more widely for food and therefore may become a problem in the domestic garden. Another minor disadvantage of The Scarecrow bird scarer is that the unit cannot face in the direction of a road where there is constant motion as this may trigger the device. Neither can the unit be used close to running water. 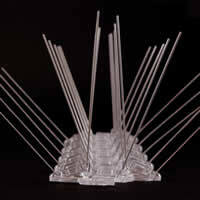 This may reduce the potential for the unit to be used to protect ponds from predation by herons and the like. 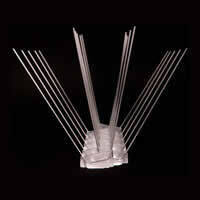 The Scarecrow bird scarer may also be triggered by human motion or pet activity in an adjoining garden. The Scarecrow bird scarer may have one application that is not discussed by the manufacturer or its suppliers and that is for use as a pigeon deterrent on buildings. Clearly the unit would have certain limitations in this respect, particularly in relation to use over the winter and in sub-zero temperatures, but The Scarecrow bird scarer is available with a mounting bracket and providing that a water supply was readily available the unit could potentially be used for deterring pigeons from the roof of a building. Protecting the roof of a building from pigeon occupancy is one of the most challenging problems facing any property owner and yet The Scarecrow bird scarer appears to offer an extremely low-cost option. The conventional method of protecting the roof of a building is to install nylon bird netting but this product is not only extremely expensive to install, in most cases costing several thousand pounds, but the system is prone to failure if not maintained. The Scarecrow bird scarer may offer property owners a method of protection that could be used alongside anti-perching products such as the anti-roosting spike to provide a greater level of protection at a much lower cost. The Scarecrow bird scarer could also potentially be used to protect flat roof areas as well as light-wells and inner-courtyards, all areas which suffer extensively from pigeon-related problems. A further application for The Scarecrow bird scarer might be large flat roofs that are used by gulls for the purpose of nesting. Gull-related problems of this type cause major problems for property owners. The Scarecrow bird scarer is unlikely to be effective as a stand-alone deterrent in this application but if combined with anti-perching products and/or other scaring products the unit may have some value. Water-based deterrents are not discussed on the DEFRA website. The Scarecrow bird scarer is widely available in the UK with a recommended retail price of £69.95 but The Scarecrow bird scarer can be sourced for as little as £54.00 from a UK-based supplier called ‘Deteracat’. To date we have been unable to find any user reviews for The Scarecrow bird scarer but we will update this section as and when user reviews are made available to us. If you are able to provide a user review for The Scarecrow bird scarer please contact the Pigeon Control Resource Centre. Training/repelling is consistent at the location, 24 hours a day. It is the environment rather than a person or other animal doing the 'conditioning'. The water spray is sufficiently surprising and unpleasant to communicate an immediate, 'Leave now' message. Sudden unexpected noise unexpected movement, and water spray. The animal immediately associates this unpleasant experience with the location. To avoid similar surprises, they begin to avoid the area. While humans flee several steps after activating a Scarecrow motion-activated sprinkler, animals are scared to a much greater degree, run much further and stay away longer. We attribute this difference in part to the inherent fight or flight survival response found in most animals and their lack of intelligence or ability to figure out what caused the annoying noise and motion. Safely and effectively repels animals without chemicals, visually objectionable barriers or shock. Operates unattended and 'sprays' when movement is detected (Day and Night). Works when motion is detected. 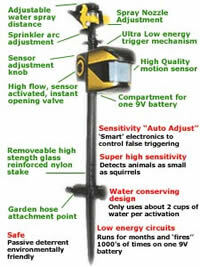 Scarecrow bird scarer protects day and night for up to 6 months (or 3000+ activations) on one 9 volt battery. The Scarecrow bird scarer is a unique and well designed deterrent that can be used for both the control of birds and animals in a variety of environments. The main application for The Scarecrow bird scarer is the domestic garden where scaring larger species of birds and cats is the main requirement but the unit also has the potential to be used as part of a conventional pigeon or gull control system. The Scarecrow bird scarer is inexpensive to purchase at just over £50.00 and as a result must be seen as worthy of a trial on the basis of cost alone. The Scarecrow bird scarer is straightforward to use but setting up the unit may require some time and patience. Once The Scarecrow has been assembled and positioned correctly, the sensitivity must be set to ensure that the unit can ‘see’ the target species within its 10-metre operating range. Once the sensitivity has been set the arc and distance of the water spray must then be set. Once these parameters have been correctly set the unit is more or less maintenance-free. The unit can be switched off to allow the user to enter the area protected by The Scarecrow bird scarer without triggering the unit. The one main requirement for The Scarecrow is an outside tap as the unit needs the benefit of mains water pressure to operate. Due to the fact that The Scarecrow bird scarer is a water-based device and requires a hose to feed the unit one minor disadvantage of the product is that it cannot be used in frost or in sub-zero temperatures. This may or may not be a disadvantage based on the proposed usage. Another potential disadvantage of The Scarecrow bird scarer is the fact that the unit may be triggered by passing traffic on a road or by activity in a neighbouring garden. In most domestic applications, however, these issues should not be a problem. If larger areas need to be protected, such as large gardens or possibly flat roof areas on a building, The Scarecrow bird scarer has the added advantage of being simple to ‘daisy-chain’ with additional units. Due to the fact that the device uses mains water pressure one hose will service countless units for more extensive applications. The Scarecrow bird scarer is extremely economical product where both power and water usage is concerned with the unit operating for up to 6-months on one 9-volt battery and only using 2-3 cups of water per spray. The Scarecrow bird scarer is an extremely versatile device offering limitless applications for the domestic user as well as having the potential to be used commercially for the control of pigeons and gulls. Clearly the only limiting factor is the need to have a water supply close to hand (and where the domestic garden is concerned an outside tap), but in most cases this should not be a problem. Even in the event that an outside tap will need to be installed in order to install and operate the device, the effectiveness of the product and the low purchase price would almost certainly justify the outlay.